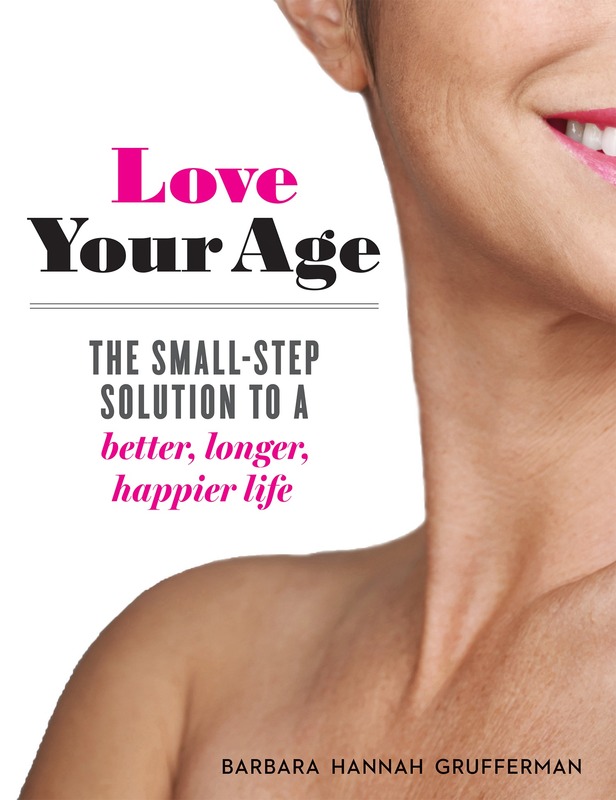 Cover of "Love Your Age." A friend once told me that when she thinks of me, she pictures a glass half full, never half empty. She said she appreciated my natural tendency to be optimistic, always looking for the positive. Well, “it” didn’t actually make me happy, because according to a lot of research, only “I” can make myself happy. Sure, compliments and good experiences can enhance our enjoyment of life—temporarily. And negative experiences can definitely darken our day. But the power is within each of us to find our own happy place, even if you’re naturally a “glass half empty” sort of person. A 2015 study that evaluated data from more than 30,000 Americans found a strong correlation between reported happiness and a longer life, which was consistent regardless of other circumstances, like health, education level, marital status, or financial situation. Researchers from University College London measured the happiness of 3,800 people between the ages of 52 and 79 and then tracked their health. After five years, 7 percent of the least happy people had died, compared to 4 percent of the happiest people. The researchers then estimated that happy older people are 35 percent less likely to die within five years than unhappy folks—even after all other factors are taken into consideration. The “Nun Study”—an ongoing project started in 1986 and conducted by the University of Kentucky—has tracked several hundred nuns over the course of decades. Data includes autobiographical essays the sisters wrote when they entered the convent as young women. Of the nuns who have died since the study began, those who wrote the most positive essays in their youth lived an average of 10 years longer than those with the most negative outlooks. Even more intriguingly, the happiest nuns were least likely to develop dementia or Alzheimer’s—and if they did develop it, they showed fewer symptoms, suggesting that happier brains may have a built-in defense system. But How Does Our Mood Affect Our Well-Being? The relationship between happiness and health is multifaceted, and not all of it is clearly understood. One known aspect is that as happiness goes up, stress goes down. And since stress suppresses the immune system and contributes to heart disease and other chronic illnesses, anything that reduces it will probably help us live longer and better. But there may be some other benefits to a good attitude as well. A Carnegie Mellon University study found that people who demonstrate positive emotions are less likely to become ill after being exposed to a cold virus. People who maintain a positive outlook and engage in positive behaviors don’t produce as much cortisol, the stress hormone. In excess doses, cortisol can raise blood pressure, reduce bone density, suppress thyroid function, interfere with blood sugar regulation, and disrupt sleep. People who regularly suppress their emotions tend to have higher blood pressure, as well as a higher risk of heart disease and cancer than people who express their feelings—both good and bad. On top of all that, happiness has been proven to elevate our mood, improve our sleep, make us more attractive to potential mates (this is true for both genders), propel us forward with our goals, improve our ability to resolve conflicts, and create stronger relationships. Oh, and it feels great, too. Happiness should not be a goal in and of itself. However, a positive outlook can add a lot to your life’s journey. For my part, I’ve made a decision to wake up happy and stay happy unless there is a legitimate reason not to be. (To help with that plan, I don’t check the news until I’ve had at least one cup of coffee.) I’ve learned even to be happy with moments of unhappiness. While some of my optimism is an inherited trait, the rest of it is a conscious effort. It’s a choice I can make every day… and I choose the habit of being happy. Wear a smile (or at least a half smile) as your default expression. Laugh out loud—and seek the people, books, and movies that get you giggling. Turn up the tunes and sing or dance along. Spend a few minutes practicing mindfulness meditation. Roll with your feelings—remember that they aren’t permanent. Speak kindly to yourself (and everyone else). Give someone a hug, and then give one to yourself. Excerpt from “Love Your Age” by Barbara Hannah Grufferman.